Fresh Ribeye Steaks on the the Grill is what most people consider Grilling. Most wouldn’t guess they are being cooked on an indoor Grill by Gaggenau. For most people, “Grilling” pertains to the use of an outdoor Grill. However, not all “Grilled” foods are made that way. When you see Grilled Chicken in the Freezer Department at the store, it is unlikely that any of it has seen the Outdoors or a Grill. Similarly, a great number of restaurants have Grilled Chicken and Steak on their Menus for Salads, Sides, Pizzas and Entrees. Many of them use a Grill Pan to achieve the familiar Grill Marks, while others Pan Sear, Broil, or Bake the meat. 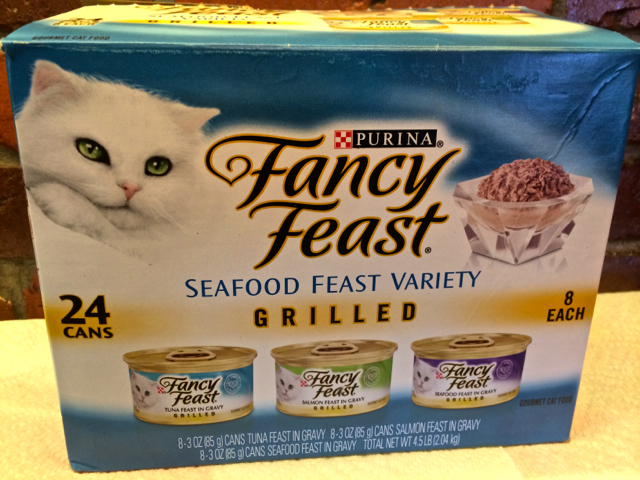 Grilled Cat Food is more for making human mouths water, probably not of much consequence to our furry friends. For better or worse, there are no “BBQ Police” to prevent manufacturers from even offering “Grilled” flavors of pet foods… So it seems that adding any form of Charred or Smoky flavor is enough to call a product “Grilled” nowadays. Of course, many GrillMasters shudder at the thought of this. For me, I shrug it off. Consumers are always free to pick and choose the products they want. 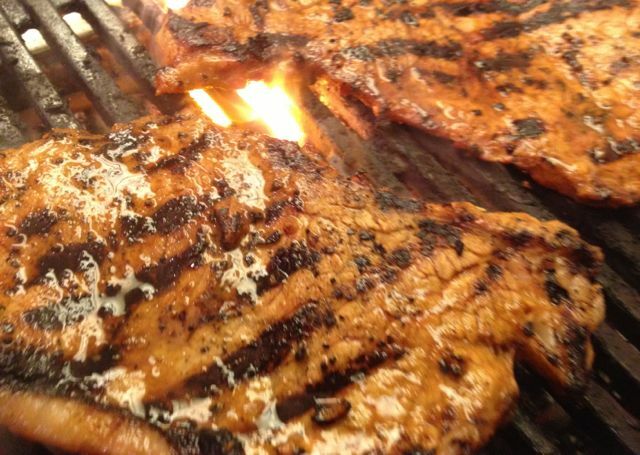 If something labeled “Grilled” meets their satisfaction, that is what the marketplace is all about. 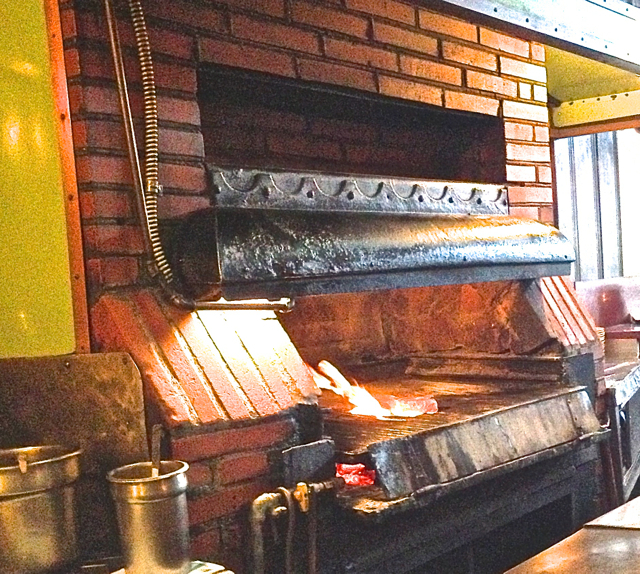 This indoor built-in Mesquite Charcoal Grill has been at Musso & Frank Grill in Los Angeles since 1919. It is said to be the oldest working Restaurant Grill in Hollywood. 1. Grilled Flavored– Products that use smoky spice blends, manufactured seasonings or processes to add flavor. 2. Cooked on a Flat Pan or Griddle– Most popular as the method for making Grilled Cheese and grilling Bacon Wrapped Hot Dogs. 3. Stovetop Grill Pan– The easiest way to get Grill Marks from indoor cooking, but not Outdoor Grilled flavor. An invaluable tool for Food Stylists and Photographers. 4. Oven-Safe Grill Pan or Broiler– These are good ways to get Grill Marks and add authentic Charred flavor to foods. 5. Indoor Countertop Grilling Devices– Probably the most famous is the George Forman Grill, which opened the floodgates to a stockade of similar items. These are said to cook foods with less Fat. 6. Indoor Built-in Gas and Electric Grills– Found in many Restaurants and upscale Home Kitchens, these come close to replicating the flavor or Outdoor Grilling, but not as close as the next one. 7. Indoor Wood and Charcoal Burning Grills– The best way to replicate the flavor of Outdoor Grilling. However, a challenge to get approved in Restaurants for sanitary reasons and concerns about ventilation. While rare to see in Restaurants nowadays, my favorite is the 90+ year old Mesquite Grill, still found today at Musso & Frank Grill in Hollywood, CA. 8. Indoor and Outdoor Wood Burning Ovens– If they can “Grill” food using conventional ovens, these offer the flavor closest to their outdoor cousins with grates. 9. Open Flame and Outdoor Pit Cooking– The oldest form of Grilling that exists. Our ancestors were not quite able to purchase Weber Grills, but managed to find a myriad of ways to cook food over open flame. 10. Homemade, Masonry and Manufactured Grills– What we most think of when we speak of Grilling. They use Charcoal, Wood, Gas, Electricity or Lasers to cook food. Ironically, most “Grilled” food products sold on the market today never come anywhere near an Outdoor Grill. The DIY Ceramic BBQ Pot Smoker from “The Adventures of TasteeBQ”. Wouldn’t you love to have been there when, after discovering Fire, the first Caveman decided to try putting some sort of Fruit, Vegetable or Meat on a Grill? Even before the time of known migration, ancestral Pitt Masters from all over the continent managed to find creative ways to cook food. This tradition is kept popular today thanks to Facebook and other Photo sharing websites and platforms where people share homemade Grills from all over the world. They are made out of anything from Patio Furniture to Shopping Carts, and even Porsche automobiles. 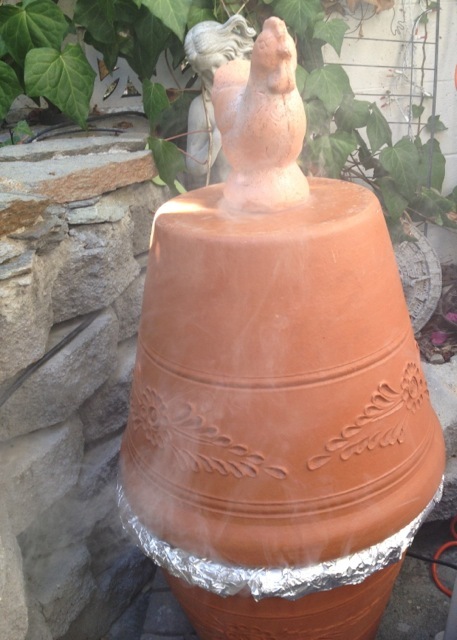 Photos of the DIY Ceramic BBQ Pot Smoker that I made last year (using flower pots) are still being shared around the world. Happy Grilling for Labor Day, and all other days you decide to Grill. Until next time, Eat and Be Well. Thanks for being among the first to visit the new “Basics of BBQ” Series. I am happy to preview it here on the Blog. Some material will be used for a current book project, tentatively called “The BBQ Catering Confidential Cookbook”. A version will also be shared on the California Gold BBQ Rubs Recipes Pages, under the New Owner’s Manual. Stay tuned, next time we will start answering the question- “What’s That Smoking?”.